Eyebrow is a very characteristic part of human face. It is often said that our eyes reveal our emotions and thoughts as they are one of the most important ways we have of expressing ourselves. However, our eyes are not the only means of expressing ourselves, eyebrows also serve a significant social function, as it helps people in expressing themselves to others. Several reasons such as removing eyebrow from the same area for a long time, some skin diseases, permanent makeup, chemotherapy may cause eyebrow hair loss. Eyebrow transplantation is required when eyebrows do not grow back in 1-2 years. These operations are performed to restore lost hair on eyebrows. With an eyebrow operation people may get back their natural looking and intensive eyebrows. Among hair transplantation operations, eyebrow transplantation requires the most attention and care. In FUE eyebrow transplant operations, it is important to provide a natural and realistic looking result. 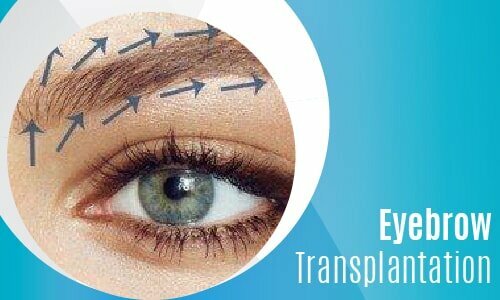 For this, angulation and curvature of transplanted grafts should be natural and a specialist must design eyebrow shape very carefully. Dr. Serkan Aygın Clinic eyebrow operations are performed by FUE technique same as other hair transplant operations. Consultation: Eyebrow shape design is decided during consultation. Operation: FUE eyebrow transplantation operations are performed under simple local anesthesia. In eyebrow operations performed by Dr. Serkan’s method of FUE, hair grafts are extracted one by one using the thinnest punches with the help of a micro motor and single hair grafts implanted carefully to recipient area. Operation takes 2-3 hours. Cleaning &PRP: Day after the operation, patients get cleaning and PRP treatment at Clinic. Individuals who have partial or full eyebrow loss are good candidates for an eyebrow operation. Transplanted hair growth can be observed within 3 months. Full results can be seen in 6-8 months.